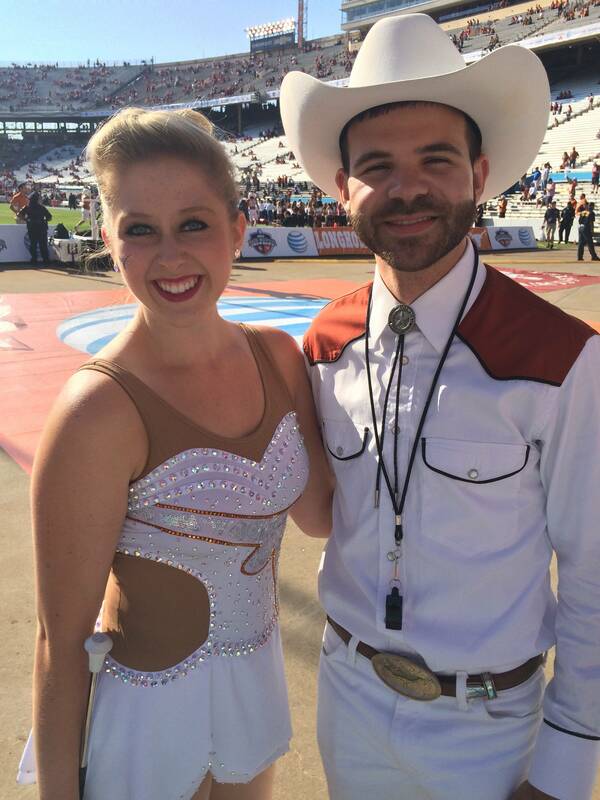 It's #TwirlerTuesday and today we are going deep into the heart of Texas to visit with Ashley Dolan, the feature twirler at the University of Texas at Austin! Ashley is a senior majoring in elementary education. What made you want to twirl in college? Ever since I can remember, I have wanted to twirl in college. After twirling for four years in my high school marching band (and absolutely loving every second of it), I was even more convinced that I wanted to twirl in college. Now, nearly four years later, I cannot imagine what college would be like without twirling in the Longhorn Band alongside the incredible family it has given me! It has truly been and continues to be a life-changing experience!! What is your twirling background? I grew up around baton twirling! Both my mother and grandmother were baton twirlers, and they are both coaches. My dad always likes to joke that I was born with a baton in my hand, but that really isn't far from the truth! The sport of baton twirling has had such a major impact on my life; it has given me the opportunity to work with incredible coaches, meet amazing friends, travel across the country and world, attend my dream university, and put my heart and soul into something I really couldn't imagine life without! How do you prep for a game? My practices with the Longhorn Band are spent writing and cleaning drill; I absolutely love to choreograph and I am always creatively invigorated by each new show we do! My individual practices are spent refining skills and trying new things. I also love to run; it really helps keep me in shape both physically and mentally! Game days are long, but they are such a blast. We have practice in the morning or afternoon depending on the time of the game, and then LHB always visualizes together about 45 minutes before pre-game. I really take this time to stretch, think through my work, and mentally prepare for that first step out onto the field. Right before we step off, I remind myself to breathe, perform, and cherish every second!! 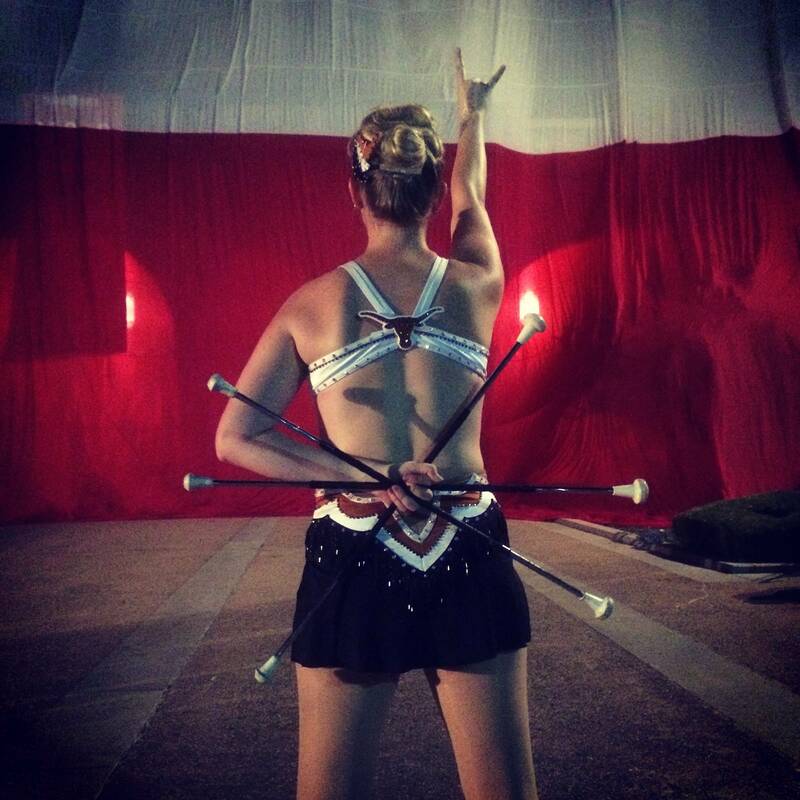 What advice do you have for younger twirlers who want to twirl in college? Believe in yourself and don't ever be afraid of dreaming too big!! What is your favorite move/trick to do on the field? What is your favorite memory so far? I will never ever forget marching through the tunnel into Darrell K Royal Texas Memorial Stadium for the first time my freshman year. It was an experience I cannot even put into words! Just knowing that I was a part of something so much bigger than myself was (and still is every time I march onto that field) unlike anything else! Anything else you want to add/share with CollegeMarching and their fans?